If you’re a classroom teacher working with students on a daily basis, then this site has got lots of resources to support your work with Habits of Mind. As a classroom teacher myself, this is where I began my work with Habits of Mind. There are several free short courses available on the site that will support your work with HOM and put you on the right track for long term success. In particular you’ll be interested in “Secrets to Succeeding with Habits of Mind” that I believe is foundational for everyone thinking of working with Habits of Mind. 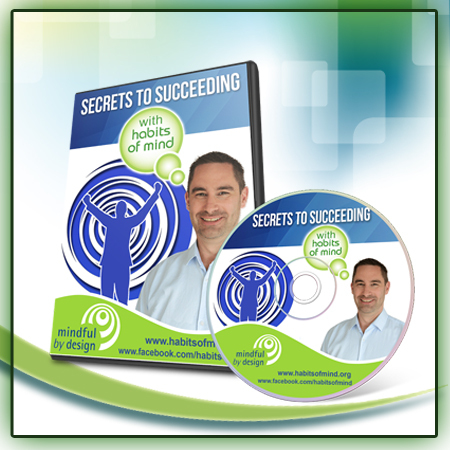 Beyond the foundational books you might be interested in my book “Succeeding with Habits of Mind” which aims to give you some very practical approaches to your work with the Habits. Other resources for your classroom available in the store include a beautiful poetry book for children called “The Mindful Garden of Verses“, which comes with a combined teacher guide and student workbook, and has been very popular with teachers. There are many more resources available throughout the site, and always more becoming available. One way to stay up to date with new resources, courses and products is to join our mailing list, using the form below. I regularly send out information relevant to teachers working with Habits of Mind. There is an ever growing range of support available to teachers working with Habits of Mind today – far more than was available when I started working with the Habits 15 years ago. I invite you to join our ever growing community of teachers dedicated to developing students Habits of Mind. Join our mailing list. Enter your details below.